Ian Smiley: I have always been fascinated and intensely interested in the making of beverage alcohol in general and in particular, distilling. I even had little experimental stills that I made when I was a teenager. And as the years went on, after I had gotten out of the university and things like that and got settled in to a job, I started getting into home brewing and winemaking. And then I got into some fairly advanced distilling processes, almost as an extension of the brewing and winemaking hobby. But I found that there was a significant lack of information. I could look up in encyclopedias, I could look up how distilleries advertised, how they did their things, but there wasn’t a lot of solid how-to information, so I got into experimenting very heavily and for years I experimented and developed processes that emulated the commercial processes. I solved the problems and actually got some good process going. I learned how to make much better stills than I had been making before and eventually I got active on the Internet, and I started getting so many emails that I was pumping out multiple seven, eight, ten, eleven page emails every day, and I got to the point where I was saving the emails in a Draft folder where people would ask familiar questions and I would take out a ten-page email and just tweak it into the response and send it out. And at that point, I decided to write a book because I realized I am in effect writing a book in bits and pieces and giving the information away, and I developed a website to sell the book. And then on my website, I started selling other distilling equipment. I had a partner named John Stone. He’s dead now, but we made a glass still together, and we were selling the glass still. And eventually, I got to know the Amphora Society—the Mikes, as they’re called in the world—and they had the PDA-1, which in my opinion is the best hobby still you can buy out there. And I got into selling those, and those were selling well. Further to that, I became involved with Brewhaus America, in Fort Worth, Texas. And they have a reflux still that they sell. A very popular style of still, but in my opinion, not an optimum technology. But I must say that that type of reflux still is probably the singularly most popular design of still among home distillers. So now that I’m the Canadian distributor of the Brewhaus line of products in general—Brewhaus and Gert Strand—I am now selling the Brewhaus Essential Extractor as they call it. Dietsch: Yeah, I saw some of that equipment on your site earlier. Now, Mike, do you mind answering that question, too? How did you get involved in building and distributing distillation equipment? Mike McCaw: I’ve been operating for the past 20 years as a process-optimization scientist for a big manufacturing company. I’m not a chemical engineer by background, but I’ve sort of become one through experience. I used to be a brewer of pretty significant proportions. I would have five or six different things on tap, in my basement, at any one time. But I tended to like my beers big and chewy. And as I aged I started to have to watch my blood sugar a little bit, so I pretty much had to quit brewing those beers because if I brewed them I’d drink them. I don’t get invited to nearly as many parties anymore. Anyway, at about the time I realized I was going to have to give up the brewing—I really enjoyed the process and had done a lot of work on processing it. I did all my brewing from grain, had a pretty sophisticated process down, and enjoyed running the process and tinkering with it. So I went out and did some Internet searching and came across this little book called How to Make Your Own Gin and Vodka. And John Stone and Mike Nixon were the authors of that. So I downloaded a copy for five dollars and read it; it was interesting, but it was a little, “Build exactly this, and do exactly this, and you’ll turn out alcohol.” And the process part was pretty interesting, but their fermentation technology stunk. So, at any rate, that started an Internet conversation, and six to eight months later, Mike Nixon proposed that we write a new book. And I said, “Yeah.” I was honored but I didn’t want to do just another version of “Do exactly this…”. So we spent the next two years writing The Compleat Distiller. And I don’t know if you’ve seen that book or not, but it really digs down into the science and somewhat into the art of distilling, but tries to give the person who reads it the tools they would need to actually design an optimal still for themselves, should they choose to do so. Dietsch: So it’s not so much a recipe book or a follow-these-instructions-and-you-will-get-this-product as much as it is an introduction to the theory and science behind the art of distilling? McCaw: Right, we have a couple of chapters on the same things for the fermentation process, and we cover distilling in the broad sense, so it’s distilling of essential oils, it’s steam distillation, but 80 percent of the book is devoted to distilling to make alcohol, but it is a general text on the whole subject. And that book is now in its fifth printing and second edition. But somewhere after a couple of years of selling the book, we started to get a lot of calls back from people, saying, “Yeah, I liked it, but I don’t have the time or skills to design and make my own.” And we designed the PDA-1 and started to sell that…. We call the PDA-1 a laboratory-scale still, and then designed the PDA-2, which we call a pilot-scale still, which would be pilot scale for a real commercial distillery, but is actually an ideal start-out size for somebody setting up a microdistillery. And that’s something that’s starting to sweep the country right now just like microbreweries did about 20 years ago. In fact it turned out that my primary interest is in designing and tweaking the design of the equipment. For me, watching a still run is a lot like watching paint dry. I’m much happier down in the workshop tweaking the designs. There’s so many different aspects to a hobby like this. Some people get involved for economic reasons, some people get involved for quality reasons, some people just want the biggest and best equipment in their basement. Dietsch: As fascinated as I was by reading the description of building a still in Matt’s book, I’m a person who can barely put together a coffee table that I picked up from Ikea. So the idea of building something like that at home is extremely intimidating. Do you find that that’s the case with a lot of your customers? McCaw: With some. I don’t know a lot, because I think most of the people who come and buy the book are people who feel handy are looking to see, What does it take to do this? We certainly get hits on our website from people who will state flat out, I do not work with my hands. I say, Okay, fine. And those are the people that we design the equipment for, those who want the highest quality and either don’t have the interest or the time in making it. But in both the home brewing community and in the distilling community that we’ve served with our business, I divide people into three broad categories, and I’m sure there’s more, or you could divide it up differently, but there’s one group of hobbyists who really are all about economics. And in home brewing I would say these are the British brewers, where beer is expensive, it’s highly taxed, and if you read the British brewing websites, almost all the recipes involve copious amounts of sugar because what they’re really trying to do is make beer cheaper. In the States, it was all about making a quality product that at the time you couldn’t buy in the store. So recipes were all about malt and people were spending a lot more money on equipment. But so there’s the pure economic person and they’re not our customer because they don’t want to spend up for a high-quality still; they’re all about, What can I do the cheapest? And then there are the people who are really into and all about trying to make a better quality product. And some of them will tinker and build their own and some want to just buy the equipment, but they’re focused on the product and not the process. That’s just the way I see it dividing out. Next up, gateway drugs, and Rowley gets a turn! Many thanks to the guys at Scofflaw’s Den for hosting this month. This was a challenging MxMo. Aside from making Old Fashioneds, I don’t mix with bourbon much anymore; I just prefer the spicier qualities of rye. But aside from blogging an Old Fashioned, I didn’t feel really inspired. Perhaps this is my own limited imagination speaking, but it’s hard for me to think of a bourbon cocktail that wouldn’t be better as a rye cocktail. Even my Old Fashioneds, these days, are sometimes rye, when I want that spicier backbone. All of my pre-Prohibition cocktail books called for rye as the main ingredient in whiskey cocktails, which makes me wonder what pre-Prohibition mixologists thought of bourbon. A skim through Charles Baker, too, shows few whiskey cocktails, and what he does offer is mostly in the Julep family. At this point, I started wondering what an anthropologist might make of all of this, but I had to stop caring because Mrs. Bitters was riding the 5:40 outta Boston, and I was running out of time to find a drink for cocktail hour. I decided to go modern, so I grabbed Art of the Bar. 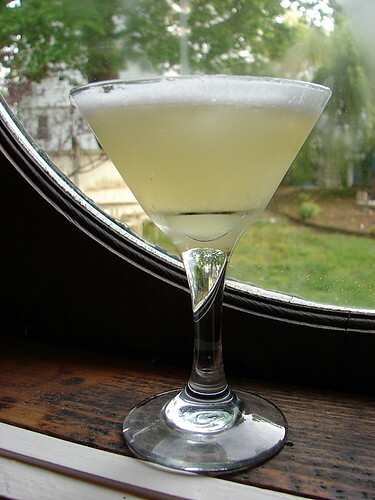 Hollinger and Schwartz had a drink called The Battle of New Orleans, which they attributed to Crosby Gaige’s Cocktail Guide and Ladies’ Companion. Perfect! I thought. Tales is coming up, so I can talk about that. I can talk about New Orleans. I can reference the song of the same name, and since I have both Hollinger/Schwartz and Gaige, I can talk about both recipes. Technique: Stir and strain into a chilled cocktail glass. Add the garnish. Whiskey, vermouth, and bitters. Hmm. Sounds like a Manhattan to me. The Benedictine is a nice extra touch. I used Wild Turkey 101 Bourbon and Carpano Antica for the chief ingredients, and about 1/4 ounce Benedictine per drink. Delicious. From the moment I touched Benedictine to whiskey, I knew I loved the combo. I always enjoy a chance to work with it. Michael Dietsch: To begin, Matt mentioned in an e-mail to me that when he’s been interviewed on the radio about his book Moonshine, radio interviewers have played up the sort of cornpone, hillbilly humorous aspects of it, which I think we all think is unfortunate. So I wanted to start by talking about perceptions of home-distilling in other parts of the world. Mike McCaw: In much of Southern Europe, it’s fully legal and always has been to distill at home. You go to any village in Portugal, Spain, during the spring or summer, Greece, much of Italy, Austria for sure, you’re going to find a stand or a store that’s specializing in hand-hammered copper brandy stills.In Southern Europe, basically what everybody’s doing is making fruit brandies from their excess fruit production. In Scandinavia, it’s widely practiced, but is illegal, and several times I’ve set next to a Swede or a Finn or a Norwegian on an airplane and started talking to them about the book and what I do and then they’ll look at me and they’ll say, “Two things you need to know: first, it’s illegal; second, everybody does it.” And it’s pretty widely tolerated.New Zealand actually is a really interesting story, because it’s been illegal since about the time of the first world war, like in Australia, but in 1996, the government realized that it wasn’t cost-effective to prosecute people for noncommercial home distilling, and they had a right-wing government or a fiscally responsible government or whateveryou want to call it at the time that looked at all of their laws in terms of whether they’re cost-effective and do they do what they’re intended to do. So they legalized it over the protests of the big distilleries. And what’s happened is, in contrast to Southern Europe, where it’s always been legal and it’s a very traditional art and there’s not a lot of innovation, after it suddenly became legal in New Zealand, there was just an explosion of experimenting and tinkering and people trying stuff and trying new things. That’s really the center of development at this time for new processes and new ways of doing home distilling, to be able to make high-quality products across a wide spectrum instead of just one traditional thing.Ian can probably talk to the legal situation in Canada much better than I could. As you know in the States, it’s quite dire. They’re not lookin’ for ya, but they will follow up any leads they get, but if they do catch a home distiller, your house is forfeit. Ian Smiley: In Canada, it is still technically illegal to home distill, but a lot of my customers have contacted their local law enforcement, to ask about it, just in case, before they bought into anything, and the answers they’re always giving now are that if you’re not selling it, we’re not interested. And I know that my website probably would have been closed down by now if the Canadian government were actively pursuing home distilling. So it’s pretty slack here with respect to that, but I don’t think they have actually legalized it per se. I’ve read the legislation over—it was rewritten in 2002—and they may not have legalized it, but they are very close to having legalized it. It’s almost to the point where maybe lawyers could argue that it is technically legal right now. McCaw: They made it the lowest priority, right? Smiley: I do know that that has actually happened to a friend of mine and the police literally refused to pursue it. They just said, “Tell me, what is it doing to you?” And the person could not identify any kind of a deleterious effect on the complainer, so they didn’t even follow up on the complaint. McCaw: The difference there is that the enforcement in the States is at a federal level and it’s in the taxing sphere rather than the law-enforcement sphere. So when it does come to their attention, they do get diligent. Dietsch: Now, Mike or Matt, either one of you might answer this. You’ve both spoken with home distillers in the States, people who are just doing this for their own home use, are they getting in legal trouble because of it? McCaw: I’ve got some anecdotal information—it’s not first hand, and you can find that same information if you go out and search the archives on the Yahoo distillers group. People do get busted, a few a year, and I don’t know what the follow-up is. I do know what the law states, though, and the law states that they can seize your house if it’s been used for illegal distillation. It’s considered the same in that sense—because it’s run out of the tax laws—as if you had illegal drugs and were running a drug operation where they will seize your house and your car and everything. Matthew Rowley: And that aligns pretty closely with what I’ve found, as well, that when I was writing my book and also the kinds of distillers I like to talk to are generally not the guys who are cranking out a thousand gallons a week. If they’re firing up their still, it’s only just a few liters or a few gallons at a time. While they’ve certainly had their share of legal troubles, it’s never really been about alcohol. It’s other things not related to that at all. And the impression seems to be that, as long as they’re just sort of keeping a low profile and not telling just everybody what they’re doing, they tend to get left alone these days. But like Mike says, it is technically illegal and, if you come to their attention—the Feds—they’ll bust just as if you were running a meth lab. Dietsch: So if you go into it, you really need to be aware of the legal risks. McCaw: Yes, you really do, and it’s surprising how many would-be customers don’t. They just assume that since brewing is legal and winemaking is legal, that distilling is too. Which is a real rational point of view and, politically, it’s a point of view that we in the Amphora Society really like to push, but it’s not the facts on the ground, as of this date. And as somebody who actually sells distillation equipment, we take the point of view—and we’re real straight up front with our customers—that we’re working on the assumption that you have a license. And if you tell us you don’t have a license, we won’t sell to you. Dietsch: I’ve seen contradictory reports on the Internet as to whether it’s legal to purchase distillation equipment without a license. Dietsch: It is legal to purchase it? McCaw: It’s perfectly legal to own a still, and it’s legal to use it for anything but ethyl alcohol production. McCaw: Oh, absolutely, essential oils, anything like that. And that’s the grounds under which most of them are sold in the States. The government will give you a permit to distill alcohol for fuel. They’ll give it to you and they’ll give it to you eagerly. Once again, you cannot do it in your house. In the United States, distillation in a building in which anybody resides is just flat out illegal. You can do it in your garage if it’s a separate building. And all you have to do to get the federal permit is give them a plan drawing of your proposed facility and then keep scrupulous records on what you produce.Your still is then legally available for inspection at [any] time, but I know a lot of people who have fuel permits, and I don’t anybody who’s ever had a drop-by inspection. Dietsch: And then of course, the process for becoming a legal distiller of beverage alcohol, from what I understand, takes a considerable time. McCaw: Many months to a few years. And really that depends upon the particular inspector you draw. Smiley: There’s one thing I can contribute there. Getting through the TTB [Alcohol and Tobacco Tax and Trade Bureau]—that’s the Federal part of it—is the easy part of it. It’s the state governments that tend to be the most difficult to get past and because you’ve got 50 states it becomes very difficult to get your product into the entire country. McCaw: Yes, and the same is true also for that fuel permit—that the Fed permit is easy, but every state has its own rules and some don’t permit it and some do and in general that fuel is only really legally useful for off-road use. So farmers [are] really the target market there.The beverage alcohol thing, one of the nasty pieces of that process is, you cannot have your permit in hand, they will not give it to you, until they have physically inspected your plant. So you have to invest all of the capital and labor up front to build your distillation plant and have it ready to go before they will even give you the Federal license. And in general, you can’t even begin pursuing your state license until after you have the Federal license. Dietsch: So, the irony there, obviously, is that you need to build the equipment to do something that, because you’re not licensed, you can’t legally be doing in the first place. Dietsch: But then, of course, if you’ve got the equipment ready, you’re going to want to test it in some fashion, I assume, and so the product that you make is then illegal, but you have to have the thing set up before they can come out and inspect. McCaw: It’s not just the product that’s illegal. That’s the nasty twist to the U.S. Federal laws. It’s the tax. There are two taxes involved. So the product is untaxed alcohol which is illegal to possess. But the tax is on the act of distillation. Dietsch: So they getcha both ways. That’s interesting. That’s a really messed-up system. McCaw: Well, it dates back to the Whiskey Rebellion. And basically the U.S. Government caved to the interests of the big distillers and brewers in Philadelphia to squelch the farmers on the west side of the Appalachians who were using whiskey as currency at that time because it was much easier to transport than grain. That’s a fascinating history if you’ve never read it. Rowley: You can see why a lot of them packed up and moved to the Carolinas and Kentucky. That’s it for part 1. Later entries will cover the panelists’ backgrounds and discuss what kinds of people are drawn to home-distilling.